Henstridge is a village and parish situated on the river Stour, lying 7 miles south from Wincanton and 114 miles east from London. 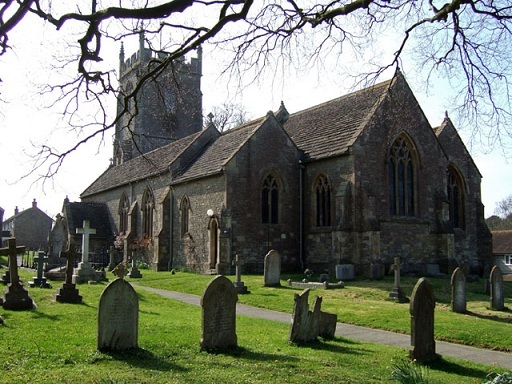 The parish was in the Eastern division of the County, Charlton Horethorne hundred, Wincanton petty sessional division, union and county court district, Milborne Port district of the rural deanery of Merston, archdeaconry of Wells and diocese of Bath & Wells. This parish shares it eastern and southern boundary's with the Somerset/Dorset County line. Therefore the Dorset parishes to the east are Fifehead Magdalen and Marnhull coming round to Stalbridge to the south. The Somerset parishes that Henstridge shares it's boundaries with are Milborne Port to the west, round to Stowell and Templecombe to the north. Most of the church of St Nicholas was rebuilt in 1873 using local forest marble with doulting stone dressings and the tower of the church was rebuilt in 1900. The church now consists of chancel, with north aisle, organ chamber on the south side, serving also as a vestry, nave of five bays, aisles, south porch and a western tower, with stair turret, containing a clock and 5 bells. The Registers date from 1653. There were also Wesleyan and Congregational chapels here and a Wesleyan chapel at Yenston. The parish also included the hamlets of Whitchurch (half a mile north), Yenston one mile north, and Bowden two miles to the north west.